If AEI were a mass media outlet, publishing this on New Year’s Eve would be considered an attempt to “bury” the story on a weekend when few people are following the news. But since our readership works on a longer time scale and are likely to find their way here over the next couple of weeks, I hope you’ll instead consider this a New Year present! It’s taken many (many…) hours of work, and I hope it helps all those working on wind farm noise issues – including local and state regulators, environmental consultants, wind developers, and community groups – to make sense of the insanely confusing world of low-frequency noise and infrasound. Here’s to a constructive 2012 as we continue to work toward siting policies that protect residents from unwanted changes to their sense of place while encouraging responsible and widespread growth of wind energy. As regular readers will know, AEI’s wind farm coverage has focused primarily on the ways that nearby neighbors respond to the audible noise from wind turbines, with far less emphasis on infrasound. However, given the ongoing public dialogue about the contribution of infrasound and low-frequency sound to the annoyance, sleep disruption, or health effects reported by some wind farm neighbors, I do like to keep abreast of research into the lower end of the sound spectrum. In this post, I’ll be summarizing several papers that have appeared in journals and conference proceedings over the past several months. This will be a much longer post than normal, but I encourage you to take the time to read through it, and to download the source papers for further study. What you’ll find here is a close reading of work from both mainstream and more cautionary acousticians, which I believe will help you to understand the subtleties of our current state of understanding in a new and clearer way. I think it’s fair to say that the bottom line continues to be roughly the same as it’s been: wind turbines clearly produce much of their sound energy at lower frequencies, including the low end of the audible spectrum (20-250Hz) and the infrasonic range (below 20Hz, which is generally below the range humans tend to hear, simply because it has to be very loud to be perceptible). Conventional wisdom continues to be that the infrasound in wind turbine noise is well below human perceptual limits, even of the more sensitive fringe of the population. This summary doesn’t directly challenge that idea, though as you’ll see, there are some indications that we may have been a bit too quick to entirely rule out any perception of infrasound produced by wind turbines. Still, I hasten to stress that any possible connection between physically perceptible infrasound and health effects remains beyond the scope of most of these papers (with a couple of exceptions). More importantly, though, it’s increasingly being recognized that low-frequency audible sound could very well be a key factor in widespread annoyance about wind farm noise. It’s important to not conflate infrasound and low-frequency sound; while the former is (always or mostly) imperceptible, the latter is clearly very audible in many situations, and indeed, is the dominant sound component of wind farm noise at moderate and larger distances. It’s quite likely that much of the annoyance people report could be triggered by very low frequency, moderately audible noise, which can be more ear-catching (or perhaps even cause physiological reactions) when it contains one or more dominant tones or fluctuates rapidly. Further, increasing evidence confirms neighbors’ reports that moderate but extremely bothersome low frequency noise can be more perceptible inside their homes than outside. These elements are part of the reason that several of the papers here from relatively mainstream perspectives (and which consider infrasound a non- or minimal issue) recommend lower noise limits than the 45-50dB standard commonly used in the US; you’ll see in these papers that 40dBA is becoming a common recommendation. Most of the more cautionary acousticians tend to recommend 30-35dB; it’s striking to me that the gap between these two perspectives has narrowed considerably in the last year or so. Among the highlights of the recent research is Møller and Pedersen’s finding that larger turbines produce more low-frequency sound (especially audible low-frequency), and that in many atmospheric conditions, sound levels will remain annoyingly high for much farther than often assumed by more idealized sound modeling. Also of note, Bray and James’ field measurements of wind turbine sound, using equipment designed to capture very short time segments, reveals a remarkable variability and surprisingly high peak sound levels in the low-frequency and infrasonic sound, to a degree that raises questions about our tendency to rely on longer-time-period averages that indicate infrasound is always well below perceptual limits. As we look more closely into low-frequency and infrasound data, both the mainstream papers and the more cautionary acousticians’ work suggest that these questions are far from settled. Some of the papers I’m summarizing here address aspects of annoyance and sound characteristics of wind farm noise that are not limited to low frequency and infrasound issues (especially including acknowledgement of the extreme variability of the overall sound levels); these papers provide important perspectives that may help us to understand why wind farms are producing more annoyance reactions than we might expect, considering their moderate sound levels. Møller and CS Pedersen. Low-frequency noise from large wind turbines. J. Acoust. Soc. Am. 129 (6), June 2011, 3727-3744. O’Neal, Hellweg, Lempeter. Low frequency noise and infrasound from wind turbines. Noise Control Eng. J. 59 (2), March-April 2011. Bray and James. Dynamic measurements of wind turbine acoustic signals, employing sound quality engineering methods considering the time and frequency sensitivities of human perception. Noise-Con 2011. Stephen E. Ambrose and Robert W. Rand. The Bruce McPherson Infrasound and Low Frequency Noise Study: Adverse health effects produced by large industrial wind turbines confirmed. December 14, 2011. David Hessler, Best Practices Guidelines for Assessing Sound Emissions From Proposed Wind Farms and Measuring the Performance of Completed Projects. Prepared for the Minnesota Public Utilities Commission, under the auspices of the National Association of Regulatory Utility Commissioners (NARUC). October 13, 2011. Kroesen and Schreckenberg. A measurement model for general noise reaction in response to aircraft noise. J. Acoust. Soc. Am. 129 (1), January 2011, 200-210. HGC Engineering, Low frequency noise and infrasound associated with wind turbine generator systems: A literature review. Ontario Ministry of the Environment RFP No. OSS-078696. Bob Thorne. The Problems with “Noise Numbers” for Wind Farm Noise Assessment. Bulletin of Science Technology and Society 2011 31: 262. The Pinnacle Wind Farm in West Virginia has been gearing up in recent weeks, with all of its 23 turbines to be spinning by the end of the year. But even as the wind farm began initial operations, neighbors have petitioned their county commission to request that the state PSC require the turbines to be shut down from 10pm to 7am. Richard Braithwaite, who lives three-quarters of a mile from the nearest turbines, says that he he “never would have believed they would make that much noise.” He told the commissioners, “If you turn the turbine one way, it sounds like a railroad train. If you turn it another way, you hear the whine. The noise wakes me up; I can’t sleep. It’s so loud … you can’t drown it out with the television or anything.” He says a simple sound meter has shown levels of 60dB and more inside his home on most nights (ed. note: it’s possible that this included other sounds); the wind developer has done some sound monitoring recently as well, though the results have yet to be released; the company has also sent a representative to visit with neighbors this week. For more on this unfolding situation, see: Mineral Daily News Tribune article, Cumberland Times-News article. Several new R&D projects are underway by providers of ocean technology, each of which either aims to reduce the harmful behavioral impacts on marine creatures, or may limit harmful impacts as a byproduct of their innovations. My good friend Michael Stocker already wrote up a solid blog post that summarizes three such projects, with links to source material and more information. Head on over to his Ocean Conservation Research blog to hear more about sonar signals modeled on sperm whale clicks (likely to be far less distressing for whales and dolphins that today’s grating signals), continuous low frequency sonar (which could reduce the source level), and airguns with less stray noise outside of the frequencies used to probe the seabottom. 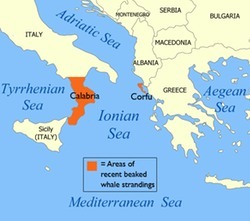 Mass whale stranding during Italian Navy exercises: sonar heard? Over the past week, a mass stranding of Cuvier’s beaked whales has taken place along the shoreline of Corfu (a Greek island) and southern Italy. The first whales came ashore on November 30, halfway through an Italian Navy exercise taking place in waters on both sides of Italy, including the 130-mile wide Ionian Sea, which separates the two stranding sites. At least one of the Italian ships is known to be equipped with mid-frequency active sonar. While it’s become common media sport to mention sonar in conjunction with any whale strandings, to the point that once I read the coverage, I rarely see any real evidence, this case is different. Most strikingly, rescuers in two separate locations during the initial strandings report hearing a “whistling” noise at 10-15 second intervals; it’s quite likely that this sound was what drove the animals ashore. While rare, this is not the first time that humans above the water have heard underwater sound transmissions during stranding events. You can read the letters of Drs. di Sciara and Aguilar de Soto after the break. Statoil has submitted an application for an offshore lease 12-15 miles from the coast of Maine for a pilot floating offshore wind farm project. Statoil, a Norwegian company, installed a single floating turbine in Norwegian waters in 2009, but has decided to move toward a larger installation in Scotland or Maine (or perhaps both). The initial lease area covers 22 square miles, but after fine-tuning their siting plan, the final wind farm area is likely to be 2-4 square miles in size. It’s unclear from the lease request how many turbines would be installed during the pilot phase, or in a full build-out. Local fishermen have expressed some concerns that the site may overlap with important shrimp and groundfishing areas, both of which have been hard hit financially in recent years. Statoil promises to work with them to minimize the impacts of its project. Floating offshore wind farms hold lots of promise for long-term increases in wind energy generation, thanks to being relatively close to urban markets, far enough from shore to be unseen and unheard, and minimizing habit disturbance during construction. The higher cost of construction and maintenance may be balanced by a much higher capacity factor (offshore winds blow much more steadily and strongly than onshore winds), and the growing size of offshore turbines. This is a leading edge for the technology, which is not expected to fully mature for 5-10 years. The State of Maine has committed to working to solve the engineering challenges of far-offshore wind, rather than tackle the social challenges of near-shore construction. UPDATE, 5/30/12: Project delays (see local news coverage): Statoil has put its plans for a four-turbine test project on hold until at least 2014, and the State of Maine initial one-third scale test turbine will be put off by one year, to 2013, by permitting delays. The Umatilla County Commission approved construction of a 33-turbine wind farm, rejecting a citizens’ challenge of the recent OK given by the County Planning Commission. In June, Umatilla County enacted a 2-mile setback provision for new wind farms, but the Chopin Wind Project application was submitted in April, so was not subject to the new rules. The 2-mile limit is at least twice that used in other Oregon counties. The County says the Chopin Wind Project, which will be built using 3MW turbines, will be subject to Oregon’s state noise standard of 36dB; another Oregon county recently decided not to enforce this limit (the state delegated enforcement to the counties years ago). The 36dB limit tends to lead to setbacks of about a half mile or so, depending on terrain and other factors used in modeling likely sound propagation. Over the past few years, new and relatively inexpensive new hydrophone systems have allowed biologists to place autonomous recorders in far more locations, collecting vast amounts of acoustic data that can help them to understand the population dynamics of marine mammals, as well as to monitor interactions and effects of human noise on marine mammal communication. They’re also looking forward to learning more about individual and pod communication patterns. But this flood of new data hits a bottleneck when it needs to be assessed by human listeners. There are several robust automated call detection programs available, but even these must be checked by humans, who can hear similarities in calls or see patterns in the sonograms that present the complex calls as pictures of the frequency patterns. To the rescue comes a new crowdsourcing project from Scientific American and Zooniverse, WhaleFM. Individuals from around the world are invited to join the research teams from Woods Hole and the University of St. Andrews by matching new recordings of orcas and pilot whales with known calls or call types (often associated with particular behaviors). While orca society is moderately well-understood, with many call types already identified, this aspect of pilot whale research is at an earlier stage, and users will help to decide which Pilot Whale calls match, and help in discovering whether the same call is make by one individual, one group, or across broad areas. For more on the project, check the link above, or this blog post from Scientific American. Jane and Julian Davis’ long-running dispute with a wind farm located 1km (just over a half mile) from their home in Deeping St. Nicholas has come to an end. On the day before their case, seeking either a permanent shut-down of the wind farm or 2.5 million pounds in damages, was due to hear the final witnesses at London’s High Court, a settlement was announced between the Davis’ and the wind farm developer. The details of the settlement are confidential, and likely less than the Davis’ were seeking, but we can likely presume that it is enough for them to buy another piece of rural property; they moved out of their home less than a year after the wind farm began operation in 2006. Update, 12/6/11: a local newspaper talks to the couple. The settlement comes as somewhat of a surprise, considering the vehemence with which their claims of being forced from their home were challenged in the first round of testimony at the High Court this summer. However, a spokesman for Renewable UK, the wind energy trade association, welcomed the news of a settlement, saying that the organization always encourages its members to work closely with local residents when planning projects to ensure that any local issues are resolved without ending up in court. To which I might say, they were a bit behind the curve this time! Yet certainly the industry would prefer to not risk negative court judgments in a high profile case such as this, which was the first such challenge to a wind farm on basis of a “nuisance” rather than as violating specific wind farm operational guidelines. This settlement is but the latest of quite a few situations in which wind developers felt it made more sense to buy property or otherwise settle disputes financially than fight nearby neighbors who had moved out of their homes or were prominent local voices about the noise impacts of siting choices. (That spree of links reflects buyouts in Ontario, Washington, Oregon, and Australia.) While the prospect of purchasing property is often said to introduce untenable uncertainty into project financing, the actual cost of purchasing a few nearby properties is dwarfed by the cost of the turbines themselves (over a million dollars each). Most of these settlements have been concessions by developers after problems arose, though in at least one Australian case, the buyouts were presented as a “sell your house or live with it” option prior to construction, which neighbors felt was an untenable and unfair choice. There is clearly movement here, in that developers are recognizing that impacts are more dramatic on some neighbors than on others, and than had been expected. Yet we also clearly have a way to go before we can say that dialogue on these variable impacts has become routine or an influence on setback distances proposed by developers. So far, we’ve yet to see any developers take the proactive approach of agreeing to keep turbines well away from unwilling neighbors, and to work with willing neighbors or willing sellers to come up with a viable site plan. That time is not far away, though, I suspect; the industry will surely benefit from reducing the contention that results when site plans lead to significant audible noise impacts on unwilling neighbors.